Made this for someone I've just sold my stand alone kit to and thought it might come in handy for others too. I used an SPDT 12v 30A relay (Maplins part code N00AW). Pin 87a (NC) is unused so you could also use the SPNO version of the same relay (I just happened to have this one already doing nothing!). The diagram should speak for itself really. The negative lead from the pump connects to the nearest earthing point on the car body to wherever you decide to situate the pump (I had it down in front of the offside chassis leg earth point next to the charger). Pin 86 on the relay is the trigger, this needs to connect to an ignition switched live (or you could just wire it to a manual switch if you wanted for some reason). The best place I found is the ignition live which already switches the ECU and fuel pump relays on (these are on the bracket on the side of the ECU). This is a black wire which goes into the back of one of those relays and a small jumper wire goes into the back of the other relay. Splice the wire shown in green in the diagram to that. 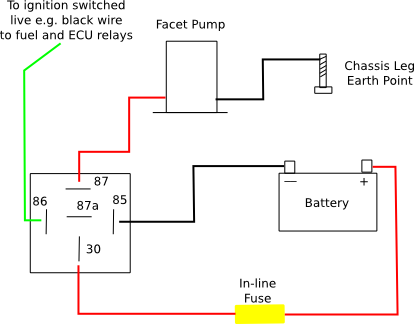 The fuse in the wire from the battery positive to relay pin 30 should be as close to the battery terminal as possible. I think I had a 15amp fuse in mine, check the rating for your specific pump on the Facet website, use a fuse which is rated a reasonable amount higher than the max current draw from your pump. Good work hayesey, very useful. Anyone able to do something similar for uprated headlight loom? Just want to say this a great diagram and works great cheers.